Today I began reading with great interest a report from the Road Map for 21st Century Geography Education Project. While my main field is history, I love maps and I’ve always thought that more emphasis needs to be placed on geography in the history-social science curriculum. In the History Blueprint Cold War unit, we are having students analyze lots of maps and to combine knowledge gained from maps and other visual sources with knowledge gained from written sources. This is a key Common Core standard: RH7: Integrate and evaluate multiple sources of information presented in diverse formats and media (e.g. visually, quantitatively, as well as in words) in order to address a question or solve a problem. 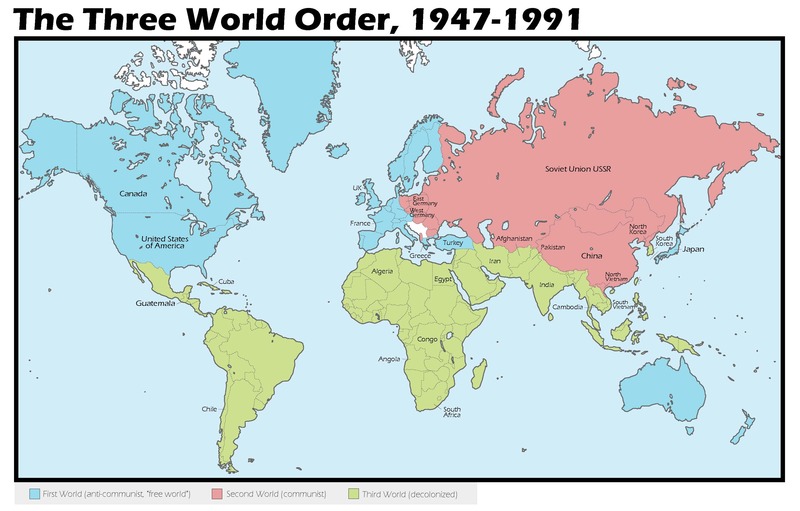 For example, in the lesson entitled “Decolonization and Nationalism,” which comes immediately after the first lesson (on the origins of the Cold War) in the world history sequence, we have students analyze a series of maps to understand the issues of the new nations which came to be called the Third World. Here are the maps and the questions of that lesson. What nations were in the First World? Which side of the Cold War did the First World take? What nations were in the Second World? Which side of the Cold War did the Second World take? Where were the Third World countries located? Which side of the Cold War did the Third World take? In which of the three worlds were most of the imperialist nations (the colonizers)? In which of the three worlds were most of the colonies? Once students have some idea of where the three “worlds” were, they move on to consider the first problem: How did the nations get their borders? In what decade did most of the African nations become independent? Which colonizer had the largest empire? List 5 nations that had anti-colonial revolts or wars after World War II. 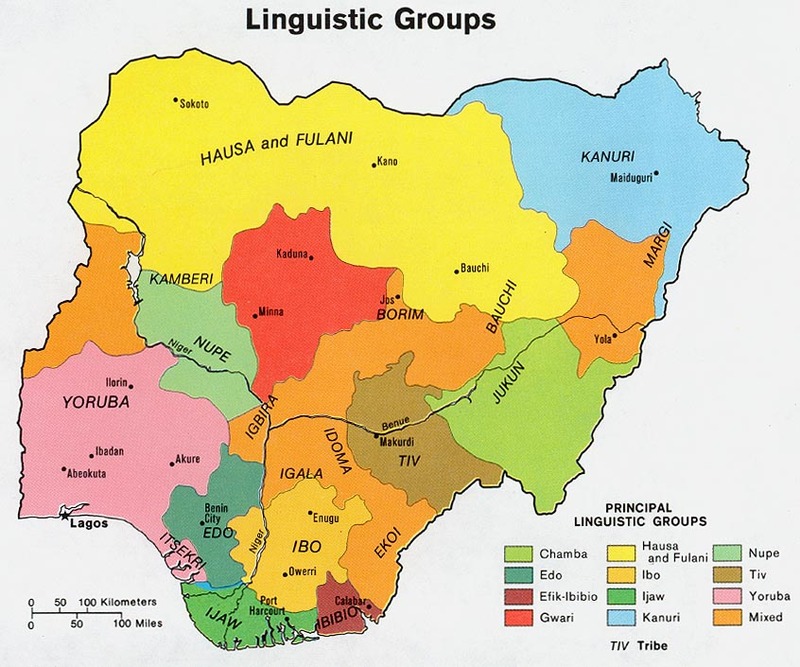 How many linguistic (ethnic) groups were combined in the nation-state of Nigeria? Find Nigeria on the Colonial Africa map. What imperialist held Nigeria as a colony? How do the colony borders compare to the modern national borders of Nigeria? What problems might that cause? Which colonies became independent before the end of World War II in 1945? Which colonies became independent between 1945 and 1950? Which nations had anti-colonial revolts or civil wars? Leading up to an analysis of the Partition of India upon independence in 1947, students look at a Red State / Blue State map of the US. Imagine you were trying to “decolonize” the US. Here is a map of the political divisions in the nation. 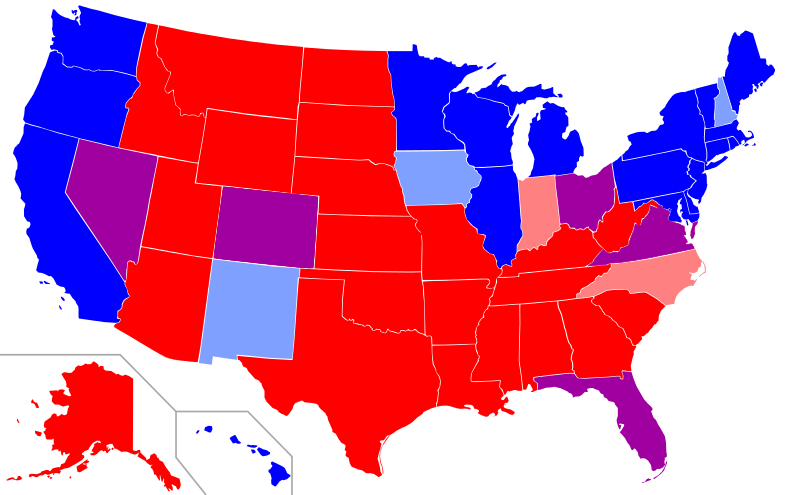 What problems might arise if you divided the US according to the Red State/Blue State Map? Students move to analyzing a 1909 map of religious adherence by region of India. When the British freed their colony of India in 1947, it was divided into two nations, India and Pakistan, based on the religious identification of the majority of the population in each area. What areas of India became Pakistan? What problems might this division of South Asia into two nation-states cause? Finally, they return to the Three World Order map, and consider another paradigm: The North and the South. There is another way to look at world differences in the period between 1947 and 1991. It is to divide the world into the North and the South. Which of the three worlds would be in the North? Which would be in the South? What were some of the differences between the North and South? The purpose of the questions is to get students to look closely at the maps and develop their geographical thinking skills in combination with historical inquiry. The rich partnership between history and geography can only help them understand their world better. Citations: The Three World Order map, the Decolonization in Africa map, and the Declonization in Asia map were created by Sonali Dujari for the California History-Social Science Project in 2013. Linguistic Groups in Nigeria in 1979, produced by the CIA. Courtesy of Perry-Castañeda Library, University of Texas at Austin, http://www.lib.utexas.edu/maps/africa/nigeria_linguistic_1979.jpg. Map of Red States and Blue States in the US, created by Angr, Wikipedia Commons GNU Free Documentation license, http://en.wikipedia.org/wiki/File:Red_state,_blue_state.svg. 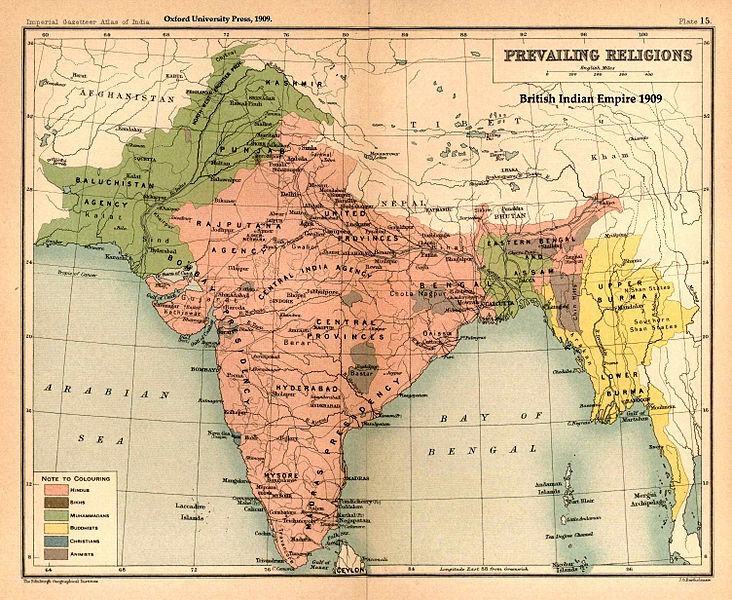 Map of “Prevailing Religions of the British Indian Empire, 1909,” from the Imperial Gazetteer of India, Oxford University Press, 1909, scanned by Fowler&fowler, 2007, Wikipedia Commons, https://en.wikipedia.org/wiki/File:Brit_IndianEmpireReligions3.jpg.